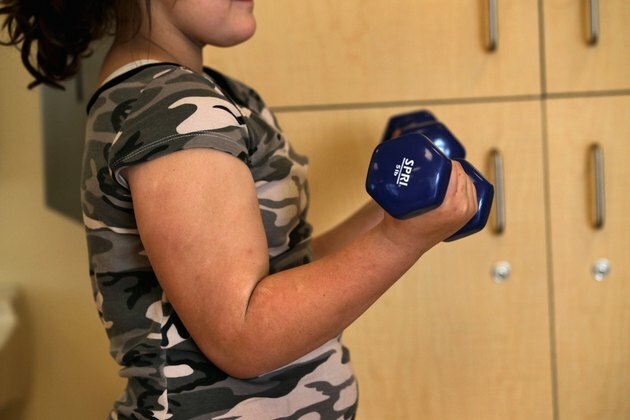 Teenagers naturally build muscle at a rapid pace. Hormones produced during adolescence supply teens with an abundance of anabolic hormones, such as testosterone and human growth hormone (HGH), that make building lean muscle mass possible. Avoid the use of illegal performance-enhancing drugs, and focus on proper nutrition and strength-training exercises. A strength-training routine helps improve your fitness level and body composition, and it helps you develop healthy habits you can carry into adulthood. Schedule an appointment with your doctor and a personal trainer. Your doctor can address any necessary limitations or modifications that a 15-year-old might need to make before beginning a fitness regimen. A personal trainer offers expert advice and training about building muscle mass, using weights and exercise machines and using the proper technique. Consume the appropriate amount of calories each day. Calories are essential for your development as a teen and necessary for muscle growth during a training program. Moderately active males between the ages of 14 and 18 need 2,400 to 2,800 calories a day, while those who exercise at a vigorous pace need up to 3,200 calories a day, according to the U.S. Department of Agriculture's Dietary Guidelines for Americans. Include one serving of protein with each meal. Protein helps to repair and build muscle tissue. Choose lean protein options, such as turkey, fish, whey or skinless chicken, to avoid adding excess fat to your meals. One serving of protein is about the size of your fist. Perform strength-training exercises three or more times a week for about 45 minutes. Work your upper and lower body on alternating days. Allow your muscles one day of rest to recover before working the same muscle group again. Use a variety of resistance tools, including free weights, stability or medicine balls, tubing and machines. The KidsHealth website recommends having a spotter available when you perform exercises with free weights or certain machines. Perform two or more sets of 10 to 12 repetitions for each exercise. Use appropriate weights when you exercise. The weights should be light enough to lift for 10 to 12 repetitions, but heavy enough that the last few repetitions are a challenge. Using light weights and high repetitions stimulates muscle growth without overtraining. Perform compound exercises that target multiple muscles and joints in the same movement. For example, a squat exercise engages multiple muscles in the lower body, including your hamstrings, calves, quadriceps, glutes, lower back and core. These exercises allow to you get a full-body workout without spending excessive amounts of time at the gym. Compound exercises also keep your heart rate up, decrease your risk of injury and improve coordination and balance.